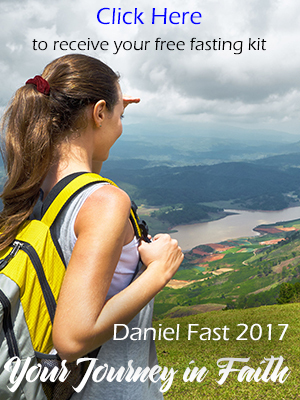 ← Daniel Fast – does it change God or change you? There is no specific time of day to eat or not eat for the Daniel Fast. Some people add this element to their fast, eating only after sunset and before dawn but is is not a requirement for the Daniel Fast. However, eating “normal foods” after hours would not be allowed. So you are correct, once you start the fast you need to stay with it 24/7. I hope this helps! Você pode solicitar uma cópia das orientações Fast Daniel indo para http://www.daniel-fast.com e digite o seu endereço de e-mail, eles serão enviados de volta para você. GOSTARI DE RECEBER A DIETA DE DANIEL !!!!!!!!!!!!!!!!!!!!!! It’s not about dieting or food restriction. Rather, it’s choosing a lifestyle where we care for the body we have, which was bought with a price and is the temple of the Holy Spirit. Out of this desire, to fulfill the job we have to be the caretakers of our body, we want to eat what is good and the foods that the Creator made for the bodies He created. I hope this helps! It’s a powerful program and has changed people’s lives . . . plus members lose unhealthy weight and gain a deepened faith and wonderful health! I’ve been on the fast for almost two weeks and am amazed at the outcome physically and spiritually! I would like to continue with a healthy lifestyle after the fast and I remember reading “somewhere” that you have a program, book or something set up for this purpose. I’m not able to see a reference to this on the lefthand bar on your site. Could you refresh my memory? Thank you so much! What type of formula is your daughter on? I have a special needs daughter who just switched from infant Neocate, and we have about 20 leftover cans that I would love to send to you if that’s what you need. Please let me know if that would help! Thank you so much for this great report. Our God is so good! He is faithful and His promises are sure. When we draw near to Him through prayer and fasting we can receive all th goodness He wants to give us. Your testimony is powerful as we see the hand of God working on your behalf. Thank you so much for taking the time to write . . . and for your generous gift to share with children in our world who are hungry and oppressed! The word says we are blessed to be a blessing. You are a fine example of this truth. I am writing to you one week after my husband Soundra and I completed the Daniel’s fast. It was a really a life changing experience and I really want to Thank you for all your emails, blogs and support during the fast. Not only for me but for thousands of others who are doing the fast. We started the fast on the 9th of Jan and completed on the 29th of Jan. We were in a quite a bit of a financial mess and one of my prayer points was for me to have a salary increase. God is a good God and HE always hears us and HE always answer our prayers. Guess what, on the Friday the 28th I received a letter from my work place to say that I have received a 11.6 % salary increase and it is effective from 1st December that means I would get the back pay. All Glory, Honour and Praise to my God. I took time to write to you about this (one week after completing Daniel’s fast) as I was waiting to get my increased salary and I want to sow a seed to your request about helping the hungry children. I will be sending this money through your website listed in your last email and once again Thank you so much for all what you do for others. I’m not sure what list you’re looking at, however, natural salt (No additives or agents of any kind) is allowed on the fast. As well as all seasonings, herbs and spices. Again, first read the Ingredients label to be sure there is no chemicals added. I hope this helps! I started the fast today for the first time with grits and an egg, was that ok? What do you do all day during the fast, stop and pray and read a scripture? Also, is there a prayer list so we can all pray for each other during our fasts? Thanks. Blessings to the two of you as you travel this path together! I started the Daniel fast this morning. My aim is to get closer to God and have an intimate relationship by the end of the fast. I also am praying for Him to release the many blessings that I know He has promised to me, to all of us, when He said in the Book of Proverbs: “The Lord will increase me, more and more, me and my children”. I know that He has plans to prosper me and not to harm and I look forward to His plans and to having a strong relationship with Him. I pray for a succesful fast, great revelations and great increases to you all. God bless you all. Yes, many people after being on the Daniel Fast and experiencing improved health want to change the way they eat. Adding healthy proteins or other healthy foods is a great way to live all year long. Be blessed on your fast and thanks for your post. The Daniel Fast is only whole grains, whereas semolina is a processed flour inwhich the bran and germ have been removed . . . so try to find a whole grain product you can use instead. Susan, thank you for allowing yourself to be a blessing to others through this blog:) Praise God for all the saints who are fasting this year. The Lord is moving in a mighty way as always! I have a question, can I cook with Semolina? I do alot of vegetable indian dishes and there is one called Upma, which is made of semolina with ginger, onions, spices, etc. I don’t use the ghee part, just very little cooking oil to season the spices and veggies. Have a blessed Sunday! I feel so much better since I have started the Daniel Fast. I have been seriously thinking on staying on the Daniel Fast Diet as a way of life. I wonder if fish could be added after day-21. I just wanted to know if anyone had any information about eating this way for a lifetime not just a fast. Good afternoon, saints of the most HIGH GOD. I do pray that all is going well with everyone and that we continue to strive for the betterment of ourselves through CHRIST JESUS, FOR HE is the reason for all of this. It’s not for nothing, we are expecting great things and it will come to pass if we faint not and continue putting our trust and faith in the LORD GOD ALMIGHTY. I am so delighted you wrote. Yes, I do recall hearing from your in December! I praise God with you for this lovely and special blessing. Our God is so good. We get stretched sometimes . . . and there are days when we may not see Him working on our behalf. That’s when we need to “keep the faith” and know that He is God, that He loves us, and that He is indeed making all things come out for our good. Be blessed and I hope your daughter is doing well! I wrote you back in December about our fast and our daughter who was under the care of the doctors at Children’s in Seattle. We just started our second fast a few days ago, and I wanted to share with you already what God has done for us! As you may or may not remeber our daughter in on an infant formula that costs us nearly $400 a month. It is a huge expense for us, and we have struggled with it. We switched medical supply companies in October, because of many issues we had with the other, and our new company had not billed us for a single can of formula. I finally called them last week, and there had been a mix-up in their billing department. I was dismayed, because we owed in the neighborhood of $1200.00 for October, November and December. However, because of the mixup they had in their office, they completely wiped out slate clean, and we owe NOTHING! They admitted their mistake, and did not expect us to pay for it! In the medical industry, integrity like that is difficult to find, and I praise the Lord he put it on my heart to change suppliers last October! God is so good, and He is so faithful! Thank you for this site, and for the opportunity to share our testimony with so many people! I hope God uses our story to be a witness to others! We are doing a 40 day fast of which part of it is the Daniel fast. We began on Jan 2 at midnight with phase one. That is eliminating caffeine, soda pops, and sugar. Phase 2 begins Jan. 13 by eliminating meats, which begins the Daniel fast. Jan 23 is phase 3 and we will eliminate pastas and rice. Feb 1 is the last phase. Beginning Feb 1 will be Liquids only for 5 days and water only the last 5 days. We are praying for spiritual revival in ourselves, our church, our town and our country. In one of the the posting, Susan reported that dextrose is a sweetner. Could someone provide a list of sweetners other than listed in the Daniel Guide? A fast should never bring harm to the body, so if this is a medication that is necessary, or if your health care provider has prescribed it, then by all means continue to take them during the fast. If you have the option of medication that is free of sweetners or man-made chemicals, all the better. I looked through a lot of the posts so as not to duplicate a question but I didn’t see where this particular question was asked.I aplogize in advance if this is a stupid question but: Is it ok to take tums? Motrin? Thank you so much for the website and answers you provide. You are a wealth of knowledge!! God Bless! I will be in agreement with according to Matthew 18:19. Be Blessed. Hello, I am 45yrs of age and I have never fast for spiritual purpose. Since I did not do my research until 1-10-11 I shall start my spiritual fast 1-12-11. I do hope many will pray that I can endure the Daniel Fast of Vegt./Water only. I am also giving up am TV so I can take the time to focus on reading my Bible daily. 2010 was not a good year for me financially but by the grace of God, he carried me through and I know I am more than blessed. So with the new year of 2011 I want to renew my faith, and hope that to live as God would have me to live will be the best way of life for me. May God continue to bless us all. I have many prayers for God to help me with this year and every year to come but most of all I am more than thankful for the years I have lived and for all his blessings I have already received. You have my support. I too am expecting great things from God that are above and beyond what I could possibly ask for hope for or wish for. I wish you blessings in your endeavor. I began my DF on 1-1-11and I will end it 2-10-11. This is my second time doing the DF fast. Unfortunately I did not complete the DF on last year due to the dealth of my nephew, but I did complete a 21 DF back in Oct 2010. And I experience wonderful blessings in my body as I ask God to take away pain that I was experiencing in my head and the anxiety I was having. It is an awsome thing when you sincerely call on the Father to heal you and He instantly does it as you are praying. No one can not tell me that the FATHER can not do the impossible. Aftert the Oct. DF I was looking forward to the 2011 fast. I am praying for my family who has been under the attack of the enemy through out 2010. I am believing the Father for a miracle in restoring my family, and I believing the Father for His will in my as He draw me closing to Him. These postings has been a blessing to me and has help me make adjustmenst to my DF. For example I did not know honey was not allowed and I thought corn was not allowed. I also did not know that the meals are usually eaten before sun rise or after sunset. I am already making the necessary adjustments in my DF. One more think I am praying more and more and I am study the word of God more, which I am enjoying myself. It is a pleasure and delight to allow the Father to wake me up each morning without an alarm clock, but instead He gently wakes me up with a gentle touch. Blessings to all of us that give ourselves to Father in this act of spirital worship by abstaining completely or partially from foods. I have started the DF today 01-09-11. I am praying that God will do wonders in my life like never before. I feel that my walk with God was stun in 2010, so for 2011 I want to be closer to him. I want him to clarify my vision, purpose, goals and dreams. There are other important reasons for this fast. I am expecting abundantly and great things that I cannot even imagine. I am asking for prayer, and strength, as I endeavour this fast. Pray for me and ask God to give me wisdom and understanding as I hold to his unchanging hands. You will find that the Daniel Fast eating plan and drinking plenty of water will serve as a excellent ongoing cleanse. You likely will not need any additional cleansing elements. Be blessed on your fast and I’m glad the eBooks have been helpful! God is good!